Dibly from UKBikeCo came down to visit on Saturday. Turned up at the door as soon as we opened clutching 3 frames. To be honest, I didn't really know who he was or what he was doing but I had vague recollections that JP mentioned he'd be visiting. I wasn't exactly sure how the meeting would turn out and didn't really want to waste too much time as it was a Saturday and there's always a mountain of stuff to do... but I have to say I was both surprised and impressed at the same time! Top of the range is the heat treated Revolution frame which will retail at £269.99. This is the signature frame of whipmeister Kane Hennessy. We had a 20.6" prototype which we promptly put on the "scales of truth". This is the lightest steel frame we have ever had in the shop, weighing 3.5lbs! My first impression of the frame was that it's just too light and the tubing on the rear triangle looks way too skinny. But if a shredder like Kane can ride one of these frames without breaking then I'm pretty sure the average kid will get on fine. UKBikeCo are obviously very confident that the frame will hold up. They are putting a life time guarantee on the frame so it must be solid! The frame itself looks very much like a Superstar New Deal except it has a much lower standover height, even lower than a Fly Tierra. Dropouts are already very small, but will be made even smaller on production models. They're gonna be shaved down so not so much sticks out when you have the wheel slammed. Another interesting point is the integrated seat clamp. It looks like the "Strawberry" system on the New Deal... not quite sure how they managed to copy it as I'm pretty sure the "Strawberry" has a patent on it. 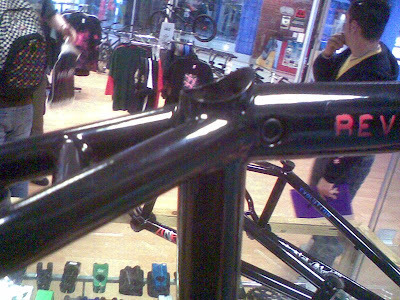 Also in the works are some 8 inch rise bars, and forks with life time guarantee that cost only £59.99! That is one ugly looking frame. Is it even a BMX? Ripped off the Strawberry seatclamp system too, well done! is this frame a joke? Lmao, the frames blatantly so kids can go whipcrazy at corby. next they'll be ridding of a toptube and spring loading their headsets. Pointless!! This frame is awsome!!!! How do i reserve one!!!! hy guys im wondering how i can get my hands on this frame?? ?